Samsung’s Galaxy Note 9 event also saw the launch of the Galaxy Watch and Galaxy Home. The former is the new name for its smartwatch series, but the device itself is very much a sequel to the Gear S3. The Galaxy Watch sticks to the same rotating bezel design as the Gear lineup and runs on Samsung’s Tizen OS. One big change which the company is touting is the addition of analog watch ticks, hourly chimes, and a depth effect which casts virtual shadows to give it a traditional look and feel. 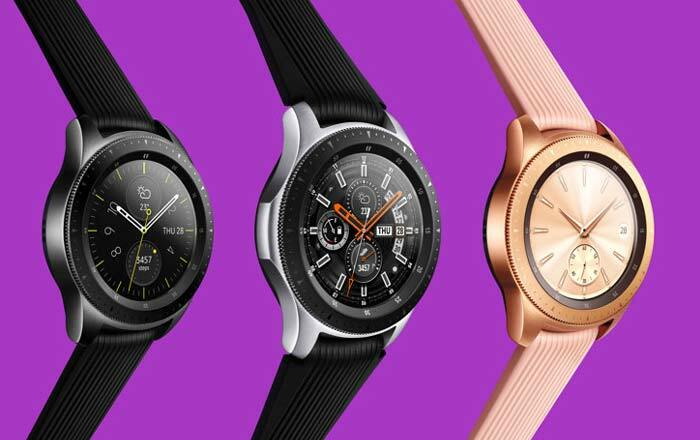 Samsung is selling it in 42mm and 46mm sizes in Rose Gold, Silver, and Midnight Black. There are a couple of differences between the two. The 42mm option has a 1.2-inch screen, 270mAh battery, and 45 hours of battery life. The 46mm model has a 1.3-inch screen, 472mAh battery, and 80 hours of battery life. Like most other wearables, the Galaxy Watch tracks calories, sleeping habits, steps, and workouts. The device has something different to offer users in the form of a stress management tracker. It can tell when a person is under stress and asks them to try breathing exercises to calm down. Samsung claims the smartwatch can be taken swimming thanks to 5ATM + IP68 water resistance, but cautions folks not to go scuba diving with it. It’s passed the MIL-STD-810G test for durability, which means it can survive 4.9-foot drops, dust attacks, shocks, and low pressure/high altitude situations. The Bluetooth/Wi-Fi version of the Galaxy Watch costs $329.99 (roughly Rs 22750) for the 42mm model and $349.99 (approx Rs 24130) for the 46mm one. The LTE variant ups the rate to $379.99 (around Rs 26200) for the 42mm iteration and $399.99 (about Rs 27580) for the 46mm one. Samsung has listed T-Mobile as the only carrier for the LTE option. The Galaxy Watch will hit stores in the US and various other markets on August 24. You’ll get a free band if you pre-order it by August 23 via Samsung’s website.